Deliver pure color with revolutionary texture to achieve the perfect highlight and contour with Mirabella''s new and improved Sculpt Duos. These easily blendable, mineral-based pressed powders create dimensionality on the face and can be worn alone or layered to create a variety of looks. Paraben-Free, Gluten-Free, Talc-Free. Recreating the healthy glow of a sun-kissed tan without the hazards of baking for hours in hot rays doesn’t have to be problematic. 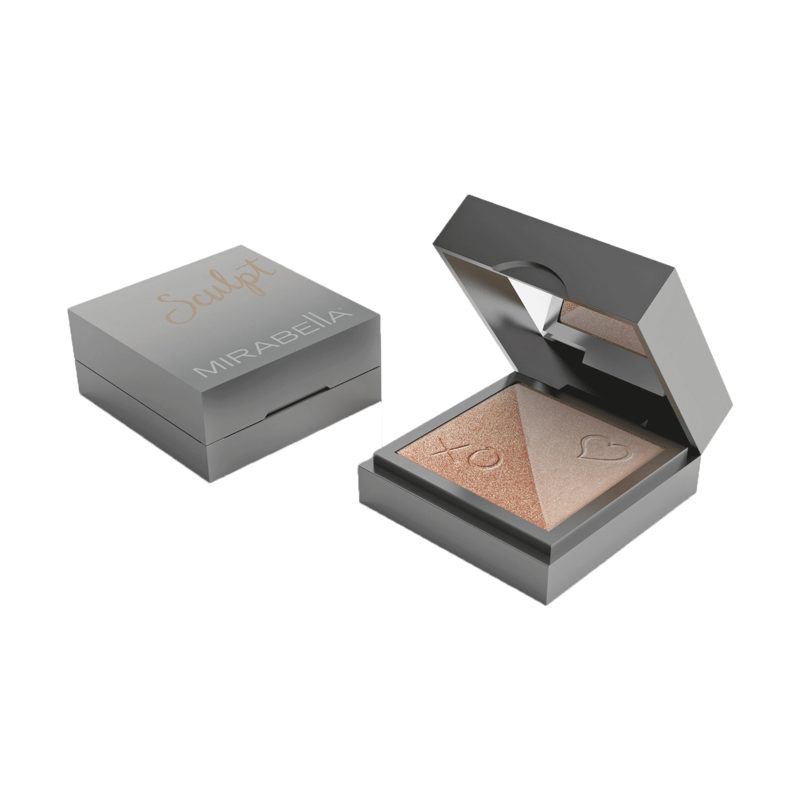 Mirabella’s Sculpt Duos provide just the right touch of color to create dimension on the face and add a beautiful glow. Our mineral-based sculpt duo pressed powders features perfectly paired bronzer and highlighter shades. This breakthrough formulation blends all the best features of cream, fluid and baked products to create a duo that adds the truest color imaginable. Creating a highly polished finished, the three Sculpt Duos add just a touch of the sun’s shimmer while ensuring a radiant look that lasts. This duo is easy to control by layering for the perfect depth of color. Skin Tint Crème – Full coverage mineral-based foundation has never been more luxurious. This water-gel formula glides on smoothly, dries quickly and transforms to create a silky, luminescent finish. With skin-protecting properties, it serves as the perfect base for our Sculpt Duos. Invincible Anti-Aging HD Serum - Improves the appearance of fine lines, skin tone and pores while moisture-rich formula hydrates skin for a flawless matte finish. Clinical trials show: improvement in the appearance of fine lines 98%, a smoother, brighter, more even skin tone 95%, and increased appearance fo skin elasticity of 95%. MICA, SILICA, CAPRYLIC/CAPRIC TRIGLYCERIDE, OCTYLDODECYL STEAROYL STEARATE, MAGNESIUM STEARATE, PHENOXYETHANOL, CAPRYLYL GLYCOL, SIMMONDSIA CHINENSIS (JOJOBA) SEED OIL, ETHYLENE/ACRYLIC ACID COPOLYMER, ETHYLHEXYLGLYCERIN, MAY CONTAIN/PUET CONTENIR/PUEDE CONTENER: MICA (CI 77019), IRON OXIDE (CI 77491, CI 77492, CI 77499), TITANIUM DIOXIDE (CI 77891), MANGANESE VIOLET (CI 77742).